Autoimmunity is the inability of an organism in recognizing its own parts asself, which triggers an abnormal immune response against its own cells or tissues. Due to such a response, autoimmune diseases occur. Rheumatoid arthritis(RA) is a chronic inflammatory, systemic autoimmune disorderthat may affect many tissues and organs, but mainly attacks the flexible (synovial) joints. 75% of the reported cases of RA occur in women, especially at age: 30 and 40 years and between 50 and 60 years (Bach, 1982). It can be a disabling and painful condition, which can lead to consequential loss of mobility and function if not treated adequately. But it is still unclear whether T-cells primarily respond to a microbial antigen, or a self-constituent antigen (Chiniet al.,2002). Fig1.1:Release of cytokines due to T-cell activation causing an inflamed synovium and pannus. Cytokines released in the synovium are Interleukin(IL)-1, IL-8, Interferon-gamma (INF-gamma), and Tumour Necrosis Factor-alpha(TNF-alpha). But the clinically important ones are IL-1 and TNF-alpha. These cytokines stimulate increase in collaginases, IL-6, chemokines, nitric oxide and Cyclo-oxigenase-2(COX-2) production. The combined action of these and a few others like IL-2 and IL-4 lead to the pathogenesis of the disease .Other than antigens, RA also involves antibodies- this is most likely due to formation of immune complexes. 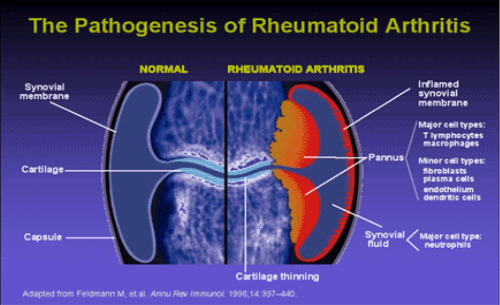 The auto-antibodies produced are called ‘rheumatoid factors’ and are specific to the Fc region of IgG. This rheumatoid factor is an IgM antibody and hence the immune complex consists of IgG-IgM which cause the damage (Janeway et al., 2001). Adalimumab is a human recombinant IgG1 mAb that has no murine component and is produced by phage display technology. It was FDA/EMA approved in, or soon after, 2002 for the treatment of moderate-to-severe RA as monotherapy or in combination with disease-modifying antirheumatic drugs (DMARDs). It is available in the subcutaneous form at a dose of 40 mg every 2 weeks. 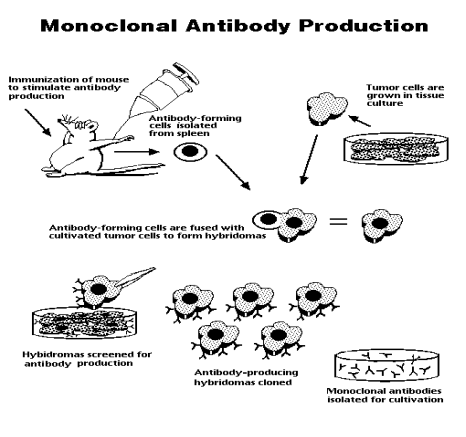 Despite adalimumab being a fully human antibody, anti-adalimumab antibodies have been detected in a significant number of patients(Vincent FB, Morland EF, Murphy Ket al.2013).Adalimumab responses and long-term sustainability may be reduced by anti-adalimumab antibodies, but adalimumab generally has good sustainability similar to that of etanercept and generally better than infliximab. Golimumab is a fully human IgG1 anti-TNF-α antibody that was generated and affinity matured in an in vivosystem. It is very similar in structure to infliximab without the mouse protein. It was approved by the FDA/EMA in or soon after 2009 for the treatment of moderate-to-severe RA in combination with MTX(Kremer J, et al,2010).